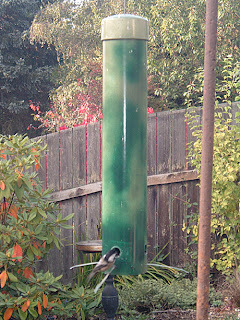 These goldfinches, in their winter plumage, are feeding and fighting at the Flexi-Perch bird feeder. Watch this male and female pair of Downy Woodpeckers enjoy some suet at the Seattle BirdCam! 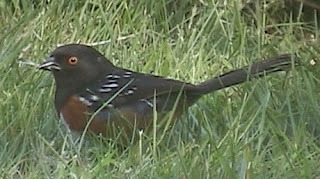 My Squirrel-Proof Birdfeeder: The "Flexi-Perch"
The Rufous-Sided Towhees now have their own page, where you can listen to three of their calls!